Welcome to the brave new world of ready-to-wear advertising. Cuckoo Campaigns enables small credit unions to compete against major banks with its stock marketing service. Basic packages start at $4,500. You just pick a campaign that you like and a Cuckoo rep will deliver a fully-produced campaign within a month. The only other things you really need are a ready-made swatch of suits, in campaign colors, and a peppy personality to match the shiny new veneer. 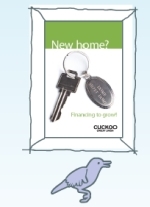 We doubt Cuckoo helps with those but we're sure there's another firm out there that will. Thanks for the shout out! We are totally excited about our new service and appreciate your positive comments. The suit idea is a good one! We'll keep that in mind.